﻿ When I was a little girl, I loved – as most little girls do – to dress up. 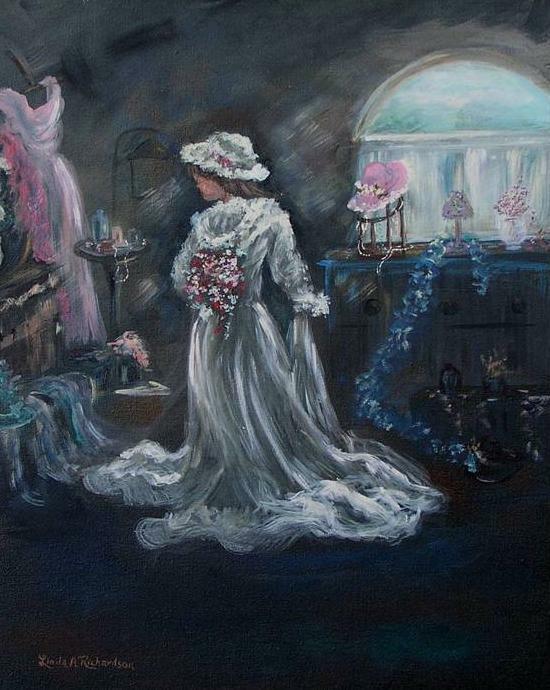 Each year on Easter Sunday, while slipping on the long-awaited, silky-new gloves, my little heart would beat contentedly, sure that there was nothing more beautiful or lady-like in all the world than those dainty-white hand coverings. Tea parties were my delight, transforming ordinary weekdays into extraordinary occasions by the donning of a favorite, frilly dress. And oh-the-joy of ballet recitals! Feeling like a fairy princess in a bright and lacy costume, my exhilaration knew no bounds when mama daintily brushed my eyelashes with mascara, patted my cheeks with blush, and painted my lips with her very own lipstick! I promised myself that, when I was older, I would defy all contemporary fashions and wear Victorian-style dresses and beautiful, formal makeup every single day. As I grew older, however, I began to scorn the “dress-up-every-day” mentality, and - decidedly, intentionally - embraced the title of a “tomboy.” Yet, even as I took pride in playing army with the boys, building forts, and acquiring blackberry-bush battle scars that would eventually pin-striped my legs, I could never completely shake off the thrill that shivered up my spine upon receiving an invitation to a formal birthday party, bridal shower, or ladies event – though believe me, I tried. The day daddy took me aside and explained that he wanted me to wear skirts on school days caused, as they say in Narnia, “the sun to be darkened in my eyes.” I complied with the rule, of course - bragging to myself all the while about what a good attitude I was exhibiting toward mom and dad – but I’m sure my parents weren’t fooled. Every opportunity or excuse I could find to wear pants, I pounced upon. I complained to my skirt-less friends on a daily basis about the trials and disadvantages of dressing femininely. I compared myself and my “unfair” rule to everyone else around me, and, consequently, discontentment reigned supreme each and every day. That any girl of eleven years, especially a princess of such an age, should spend weeks and months wallowing in rebellious discontentment is a tragedy to be sure – but the even greater tragedy was that, despite my constant harping, I remained completely oblivious to the sinfulness of my attitude. It was not until a few months after turning thirteen that I experienced a shocking, but rejuvenating, splash from the icy cold water of the Word. That day I will never forget. I was in Iowa, in the midst of my very first “all-by-myself” trip, visiting my aunt, uncle, and newborn baby cousin for a couple of weeks. Separated as I was from my family, and struggling with homesickness, I clung to my daily devotional time with a dedication to which I was unused and unpracticed. My minutes spent reading the Bible and praying comforted and consoled my loneliness, and even now I look upon those days as the point at which I really began to love God and desire His ways. In a heartbeat, the Holy Spirit overwhelmed me with conviction. I realized that my distaste for wearing skirts had originated and grown over the past two years to the point that I stood there, before God, confessing that I wanted to wear pants simply because “everyone else did.” Was this not seeking friendship with the world? I shuddered and cried at the ramifications of such a desire. If I wanted this acceptance, this “friendship,” I wanted to be an enemy of God! The verse I had just read labeled me – one who held such a desire – as an adulteress! Shocked and convicted, I knelt before my King and begged forgiveness for the rebellion and irritation I had harbored toward my parents: for placing a greater desire on the outward trends of the world than on the inward purity of my heart. I begged Him to teach me how to submit joyfully, to not only obey my parents’ wishes, but to make them my own – and He, in His amazing power, answered my prayer. About a week later I was home again, back to the daily “mandatory” skirt wearing (in Iowa I had worn pants because I was working on my aunt and uncle’s dairy), but I was both surprised and delighted at the anticipation, the excitement, and the hop-skippety thrill I felt as I pulled on a skirt with every passing day. Over the next several years, I would develop, with the encouragement and input of my parents, more precise, Biblically-based standards and convictions for the way I was to dress. These convictions did not dictate that I wear only skirts, but I soon discovered that, more often than not, skirts and dresses better fit the standard of modesty and femininity than did the pants in which I used to delight. Once again, I dreamed of fancy Victorian outfits. Once again, I was ecstatic at the opportunity to wear beautiful, feminine clothes on a daily basis. And once again, I felt my heart flutter with excitement on those special occasions when extra frills were allowed. I had returned to the love of dress-up.